Watching the Olympic men’s gymnastics trials this past weekend, I noticed one of the athletes getting ready for his pommel horse routine. His eyes were closed, and his hands were moving in the air in front of him as he went through the routine in his mind. When he approached the pommel, you could see that he was relaxed and totally focused, and he went on to do a great routine. A guest essay in Saturday’s Democrat and Chronicle entitled “Clearing Mental Hurdles” explores the importance of mental preparation. SUNY Brockport professor Dana Voelker says, “It is no surprise that to win gold, athletes must be in peak physical condition and possess superior technical skills. But when some of the world’s best athletes crack under pressure, we are reminded that elite athletic performance isn’t all physical – it’s mental, too.” Coping with stress, goal-setting, a keen ability to focus, imagery techniques – these are all part of their strategy. This isn’t just for athletes: musicians can also use these techniques. It may take many hours of practicing until your fingers have the muscle memory to form the notes and you get the sound you’re looking for. But there’s also a certain amount of mental preparation to stay focused and not get stage fright or lose your place in the music. A few years ago, I had the privilege of being in the sound booth as WXXI Music Director Julia Figueras interviewed Van Cliburn Award-winning pianist Alexander Kobrin. She asked him what he did right before he went on stage, and he said he just kept going over the music in his head, which helped him stay calm and focused. One of the most famous examples of visualization is this story about Olympic athlete Jim Thorpe. On his way to the 1912 Stockholm games on board an ocean liner, instead of actual physical training, he spent much of his time just sitting on the deck, visualizing himself winning the long jump. He went on to win the gold medal in the pentathalon and decathalon. This sounds a little like something from a fantasy or sci-fi novel, but I can attest to the power of visualization. 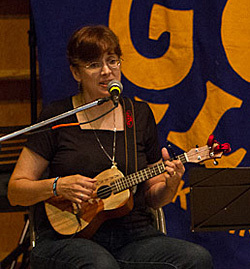 I sing and play folk music on ukulele and mountain dulcimer. Right before a performance, I try to slow things down and just think about the music, going over in my head the parts that are likely to be the most challenging, reminding myself of the structure or shape of the song. This helps me to feel prepared so once I go on stage, I can relax and enjoy making music. In my mind, the winners are those who can stay focused amidst all the noise and media attention, and who also are clearly enjoying what they do. Just look at that big smile on Gabby Douglas’ face when she won the gold medal in the all-around gymnastics competition! This entry was posted in Synchronicity: Musings on Words, Music, and the Arts and tagged focus, mental imagery, mental preparation, music, Olympics, visualization. Bookmark the permalink.